Scenic Chairlift – Ride to 2000m. The three active volcanic mountains Ruapehu, Ngauruhoe and Tongariro are located at the heart of Tongariro National Park. Ride two chairlifts over stunning volcanic terrain and ancient lava flows to an altitude of 2020 meters above sea level, Lifts run 9am-4pm weather dependent except Christmas Day. There are a variety of walks at Mt Ruapehu suitable for a range of abilities, with great photo opportunities of the Tongariro National Park. These free walks are a must-do! Meads Wall Walk – An easy 30 minute walk, Meads Wall was a filming location for the Lord of the Rings Trilogy. 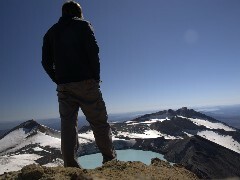 Experience a spectacular journey to the pristine Crater Lake near the highest point in the North Island. Venture through rugged volcanic terrain & learn about the geological & cultural significance of Mt Ruapehu, the Tongariro National Park and New Zealand’s first Dual World Heritage Site. Knoll Ridge Café; Open 9am-3:30pm. Have lunch and enjoy the breath-taking views from the Knoll Ridge Café. A scenic chairlift ride will transport you to the architecturally acclaimed Knoll Ridge Café 2020 metres above sea level. The Café was constructed in 2011 and replaces the original Knoll Ridge Chalet which was destroyed by a fire in February 2009. Lorenzos’ Bar and Café – Open 8:30am – 4:30pm. Vertical Retail Store – Open 8:30am – 4:30pm. 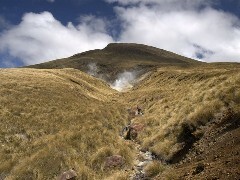 The mountains of the Tongariro National Park have deep spiritual significance for the Maori people. Legend has it that the high priest Ngatoroirangi was frozen in a snowstorm while exploring Tongariro and he called to Hawaiki, the traditional Polynesian homeland of the Maori, for fire. His prayer was answered, via the channel we now call the Pacific Rim of Fire, and the mountain erupted. Mount Ruapehu is one of the world’s most active volcanoes. Minor eruptions are frequent and Ruapehu has erupted at least 60 times since 1945. There was a major eruption in September 1995 and the last recorded eruption, which was just a little one, happened in October 2006. Luckily, volcanoes don’t erupt without warning so visiting the mountain is quite safe. Above all, the sites are constantly monitored. Mount Ngauruhoe is the youngest vent and highest peak in the Tongariro volcanic complex on the Central Plateau. Ngauruhoe first erupted about 2,500 years ago. Although seen by most as a volcano in its own right, it is technically a secondary cone of Mount Tongariro. 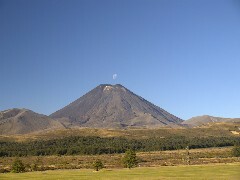 Mount Ngauruhoe was used as a stand-in in Peter Jackson’s The Lord of the Rings movie trilogy, achieving worldwide exposure. Mount Tongariro is the most northern of the group of three active volcanoes of the Tongariro National Park. Mt Tongariro (elevation 1968 m) is a complex volcano of several craters that have blown their way out of what was once probably a much larger mountain. In the 1950s Tongariro pumped fountains of lava 300 m into the sky and in 1967 it sent glowing clouds of gas and ash down its slopes. Since then, it’s been relatively quiet, just puffing out the occasional cloud of gas or ash.